Grand Prix dressage rider Caroline Roffman gets into the groove with Vade-Mecum Interagro as DSharp plays the violin. A Brazilian Lusitano dressage horse, a US grand prix rider, and an international musician have gotten together to film a music video in Florida. DSharp, an Electronic Dance Music performer, producer, and DJ, as well as a classically trained contemporary violinist, filmed the video in Wellington with grand prix rider Caroline Roffman, who partnered Lusitano gelding Vade-Mecum Interagro, from Interagro Lusitanos. DSharp serenades a horse at Caroline Roffman’s Lionshare Dressage. DSharp fuses hip-hop, classical, and EDM music, and has graced high-profile clubs across the globe, including in Sweden, Amsterdam, the Philippines, and Dubai. He got together with Roffman, who is known for creating freestyles that incorporate modern musical trends, when the rider reached out about creating the music for her dressage freestyle test after seeing music video posted online. DSharp was excited about the idea but wanted to push the collaboration one step further — and contacted Roffman about creating a music video. 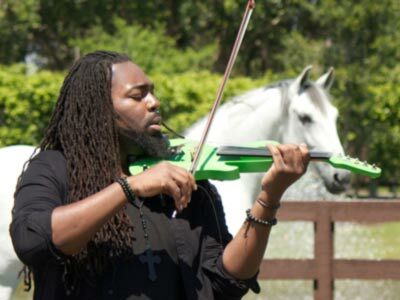 While scheduled to be in South Florida for performances in conjunction with Miami Music Week, DSharp and his team arranged to shoot the music video with Roffman at her Lionshare Dressage farm in Wellington, Florida. Roffman hosted DSharp and his team with assistance from her sponsors, including Equiline, which dressed her in the finest in equestrian fashion for the filming; Vita Flex; and Charles Owen. Australian Grand Prix show jumper Ben Meredith can be seen in the music video flying over a Vita Flex oxer at Lionshare Dressage. Interagro Lusitanos allowed Roffman to ride the stunning Grand Prix gelding Vade-Mecum Interagro for the video. Vade-Mecum was one of three horses Interagro Lusitanos brought to Wellington from their base in Brazil for the winter dressage season. The project was filmed on March 30, with several members of the media on hand. The music video will debut on DSharp’s YouTube channel and will likely air in Britain and other European outlets. Roffman, who won the FEI’s Rising Star award in 2010, is accustomed to being in the spotlight, especially throughout the great success she has enjoyed with her partner Her Highness O. The pair was short listed for the US dressage team for the 2014 World Equestrian Games. In 2013, Roffman and Sagacious HF were the Reserve Champions at Aachen CDI-O5* Under 25 Grand Prix. She earned the title of USEF National Intermediare 1 Champion in 2012. The musical freestyle that Roffman and Her Highness O performed to Katy Perry’s “Roar” at the Adequan Global Dressage Festival last year became so popular between both equestrians and non-equestrians alike that its video went viral online. After watching Roffman perform dressage movements and Ben Meredith soar over the Vita Flex jump, DSharp was inspired to try riding himself. At the end of the video, DSharp was able to ride a dressage horse – a fitting ending to the day of filming.